Ned Rozell | Geophysical Institute Feb 16, 2019. 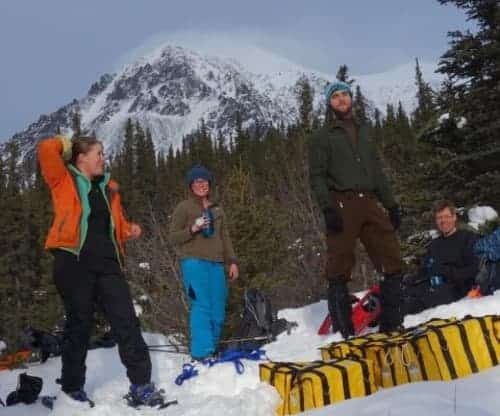 With Panorama Mountain in the background, from left, Lynn Kaluzienski, Elizabeth Berg, Cole Richards and Carl Tape take a break from stomping out a 1-kilometer snowshoe line across the Denali Fault near Cantwell. Photo by Ned Rozell. Cole Richards says this while watching three companions kick their steps Chilkoot-Pass style into an abrupt hill. The slope rises from the pancake floodplain of the Nenana River just behind him. The landscape here seems a bit confused. Richards, a graduate student in seismology at UAF’s Geophysical Institute, is standing in snowshoes on the Denali Fault, atop a foot of compacted snow. The Denali Fault is a weak spot in Earth’s crust that has maintained a frown across the middle of Alaska with its continual jerky movement. One of the most obvious strike-slip faults in the world (where land on one side of the fault creeps in the opposite direction of land on the other), the Denali Fault unzipped more than 200 miles of tundra and ice during a giant 7.9 earthquake in 2002. Richards and nine other scientists are performing some rare February fieldwork here, where the fault didn’t rip during 2002. They are driving 400 seismometers into frozen soil. Their goal is to get exquisite detail on this geological feature that a person can see on a flight from Anchorage to Fairbanks as a straight line of lowlands and glacier ice in the middle of white Alaska Range mountains. The 10 scientists, including pairs from both Utah and South Dakota, have divided their labor into three sectors. Three people have driven up to Nenana and are working southward along the Parks Highway. Three have driven to Trapper Creek and are moving northward. The team of four here beneath Panorama Mountain are sipping from water bottles on a snowy hilltop at what team leader Carl Tape calls ground zero, exactly on the Denali Fault. They have just snowshoed a straight path about a kilometer southward toward the Nenana River, and have returned on that same line. While the snow compacted from the passage of four people firms into a trail, the researchers relax next to 10 yellow bags, half sunk in snow. Inside each bag is a six-pack of what they call nodes, portable ground-motion sensors that look like large oil filters with steel spikes poking from the bottom. Here at what Tape estimates is a straight line crossing the fault, the scientists will shove the nodes into the ground every 100 feet, orient them to the north, turn them on, and bury them beneath snow. Tape, the Geophysical Institute seismologist, is in no rush on this first day of deployment. A few years ago, he learned the value of waiting for the trail to harden while placing similar instruments over the fault where it crosses the Richardson Highway. Their 94 instruments will remain quietly in place until their batteries wane in March. The other teams will install 306 more nodes closer to the highway from Trapper Creek to Nenana. Those teams will install seismometers about 1 kilometer from one another. Near the end of March 2019, someone will retrieve all of the nodes. By then, the instruments will be full of information of how much the ground shook, and in which direction. The results should tell seismologists quite a bit more about the Denali Fault and what lies deep beneath it. On this day, just a few weeks past the coldest day in North America’s history (-81 F, in 1947) and with endless sunshine a few months ahead, many Alaska scientists are in their offices either planning fieldwork or working up last summer’s numbers. Why did the seismologists choose mid-February to deploy their instruments? One reason is because the spikes on the nodes can bite into frozen ground and remain cemented there by ice, Tape said. Another is that nature’s version of vandals, bears, will probably remain in hibernation for the length of the experiment.